Medium to medium hard, multi-toned. Brighter than the ES12 model. Birch shafts. One of the rising stars of the marimba, Eric is noted for his extremely unique and expressive style. 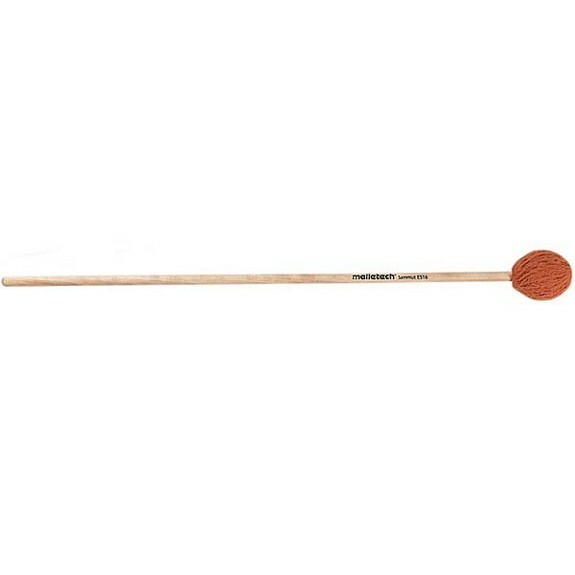 His mallets feature a custom and distinctive orange yarn, and unusually heavy heads for a very full sound. Great mallets, great price, fast shipping. No complaints. These mallets are the same weight as the Stout mallets. They are both 40 grams a mallet. So if you are looking for something that plays like the Stout mallet but is a harder, these are the mallets for you. Because of the weight of the mallet you can play softly in the lower register of a 5 Octave but only soft, unless you want a big bite in the low end of the marimba. They work great in the middle to upper end of the marimba and the yarn is better than the Stout mallet yarn. The ES16 is a wonderful medium-hard mallet for players seeking a heavier mallet with less contact/attack noise. The moderate weight and balance of this mallet generate a warm fundamental and rich, full-bodied tone. If not the heaviest mallet in the Malletech Signature Series, the ES16 is slightly heavier than the Stout GS13s and substantially heavier than the Stevens series.